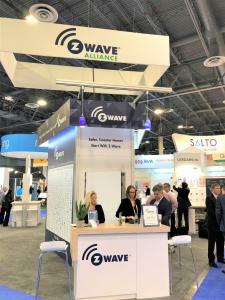 LAS VEGAS, NEVADA, UNITED STATES, April 9, 2019 /EINPresswire.com/ -- Las Vegas, NV – April 9, 2019, 11:00 a.m. EST – ISC West 2019, Booth 31051 — The Z-Wave Alliance, a global membership organization dedicated to advancing the popular Z-Wave wireless smart home protocol, will host the Z-Wave Pavilion at ISC West 2019 in Las Vegas, with Alliance members introducing and demonstrating their latest Z-Wave solutions. The Z-Wave Alliance offers security dealers and integrators the opportunity to interact with the latest Z-Wave technology in one central location as well as network with manufacturers that are leading the global smart home and IoT security industry. •	Danalock will demonstrate how their Danabridge V3 enables remote operation of their newest smart lock, the Danalock V3 and showcase the Danapad V3 wireless access pad and Universal Module V3. •	Everspring will display their new range of Z-Wave sensors with the Z-Wave S2 Security framework. •	Leedarson will present their new IoT solutions designed to enhance smart home security, monitoring, lighting and energy, and enable voice activated commands on products that work with Amazon Alexa, Google Assistant, and IFTTT. •	Parakeet will showcase their enterprise solutions for MDU owners and managers to enable centralized remote access control of primary property functions like HVAC monitoring, door locks, garage doors, thermostats and more. •	SecureNet is presenting their SecureNet platform that simplifies and expands the capabilities of central monitoring stations and alarm dealers to add lifestyle services to their existing alarm transportation offerings. •	ShenZhen NEO is one of the earliest professional manufacturers of IP Cameras in China, providing indoor wireless IP cameras, wireless outdoor IP cameras, mini PTZ IP cameras, dome IP cameras and outdoor PTZ IP cameras and more. •	Vision is showcasing their Z-Wave compatible U-Bell alarm, Wall Remote, and Wireless Siren and Strobe that receives activation commands from an alarm system. Z-Wave® technology is an open internationally recognized ITU standard (G.9959). It is the leading wireless home control technology in the market today, with over 2600 certified interoperable products worldwide. Represented by the Z-Wave Alliance and supported by more than 700 companies around the world, the standard is a key enabler of smart living solutions for home safety and security, energy, hospitality, office and light commercial applications.